This summer Victoria Park will be transformed into a swashbuckling land of pirate battles and mistaken identities as Hubcity Theatre presents William Shakespeare’s Twelfth Night. Hubcity is pleased to welcome former artistic director Paul David Power as guest director for his pirates in peril take on the show. The play centres on look-alike siblings Viola and Sebastian, who are separated in a shipwreck, and the confusing love matches and mistaken identities that follow. In another twist, the production sees most of the male actors playing female roles and most of the female actors playing male roles – a nod to the traditional practice of female roles in Shakespeare’s time being played by men. “I took the timely approach of gender blind casting. Roles were cast based soley on the actor’s ability for a particular part. It’s a modern take on traditional Shakespearean casting as our society becomes more gender fluid,” says Power. 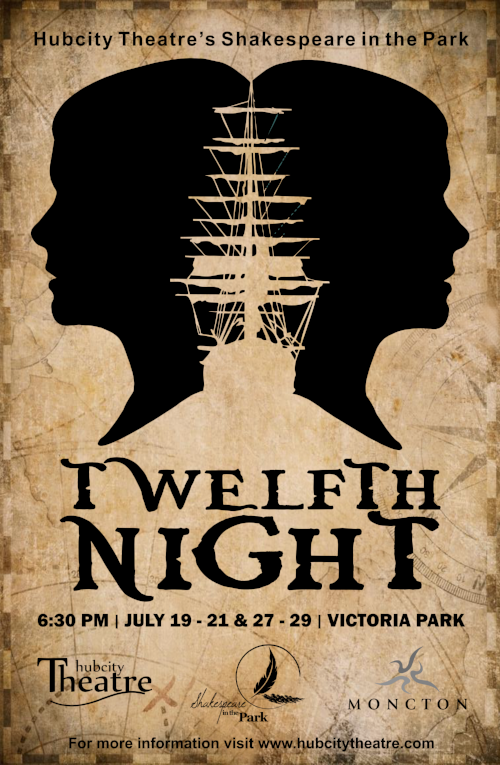 Twelfth Night plays in Victoria Park, Moncton at 6:30 p.m. from July 19 to 21 and 27 to 29. Admission is by donation only. The audience is encouraged to bring their own chairs or blankets for seating, there will be no seating provided. To stay up-to-date on news, including invitations to audition for upcoming shows, be sure to follow us on Facebook, Twitter or Instagram.